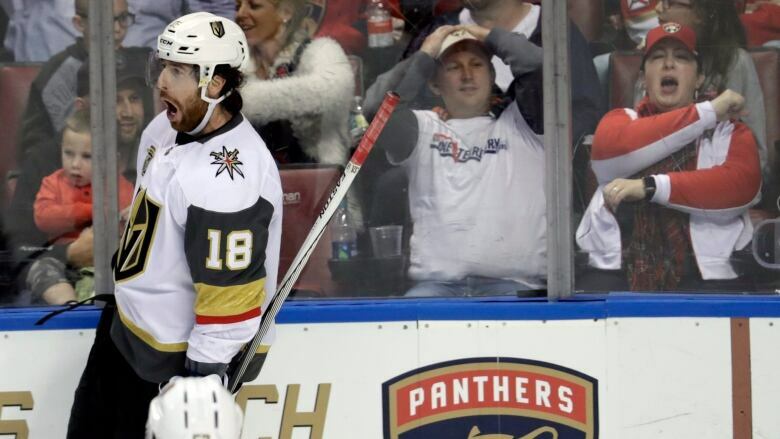 James Neal and Jonathan Marchessault scored to help the Vegas Golden Knights beat the Carolina Hurricanes 5-1 on Sunday night, giving the first-year franchise the best record in the NHL. The Golden Knights are giving Vegas an incredible, odds-beating story in their first year on the ice. With a roster built on everybody else's spare parts, this expansion team has the whole league playing catch-up. The Golden Knights are 31-11-4, good for 66 points. That's one ahead of Tampa Bay, which had the night off. Vegas is two wins shy of tying the record for wins by an expansion team, shared by the Anaheim Ducks and Florida Panthers in 1993-94. Just don't expect the veteran-heavy Golden Knights to get caught up in their unexpected standing. "It's an interesting story, and it's still being written," forward Colin Miller said. "I'm happy to be where I'm at, with the team I'm with," Gallant said. "Every guy in our room knows there's a long part of the season left," coach Gerard Gallant said. "We can't worry about looking at the standings." Bellemare scored less than three minutes in, setting the tone. He took a nifty back pass from William Carrier, who drew two skaters and the attention of Darling. Bellemare put the puck through Darling's legs for his fifth goal. Miller and Marchessault scored 39 seconds apart in the first, leading Carolina coach Bill Peters to call his team's timeout. He then signaled for Cam Ward to replace Darling. Neal scored on a second-period power play, giving him at least 21 goals in 10 consecutive seasons. He gathered the rebound of Brad Hunt's shot and poked the puck past Ward.